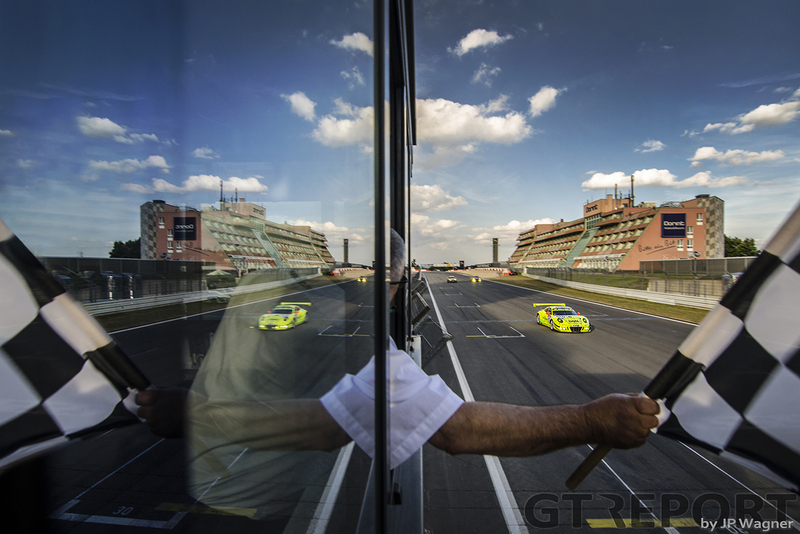 When Manthey Racing returned to the VLN championship this year it came back in full force. Full works driver line-ups for its brand new Porsche 991 GT3Rs and a small army of Porsche engineers were brought to the Nordschleife to leave nothing to chance in its showcase of the new car’s worth. 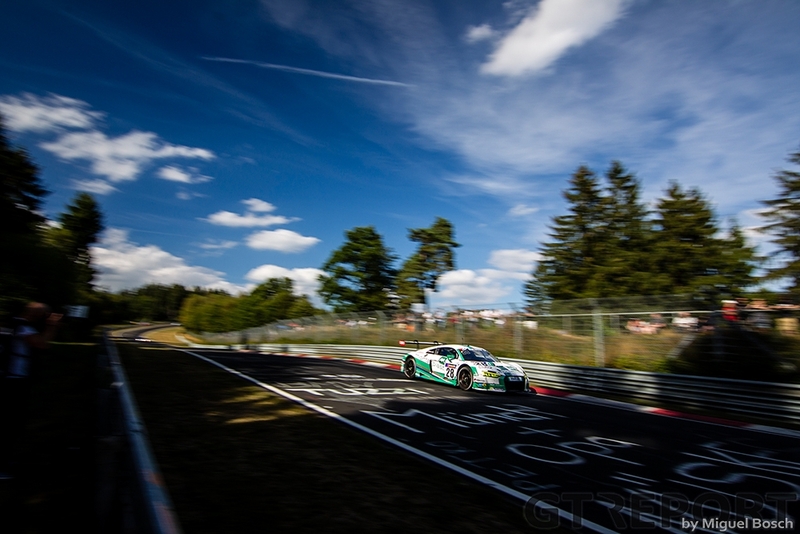 Excitement quickly turned into struggle as problems with the car and a tough break with the Balance of Performance kept Manthey from being a constant top contender. 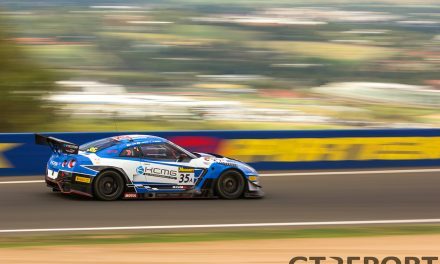 It wasn’t until after the 24 Hours of the Nürburgring that the team broke the chains, fought a vigorous battle with Land Motorsport for the win in the fifth VLN race and then, after five failed attempts, took the win in the ROWE 6-Stunden ADAC Ruhr-Pokal-Rennen. 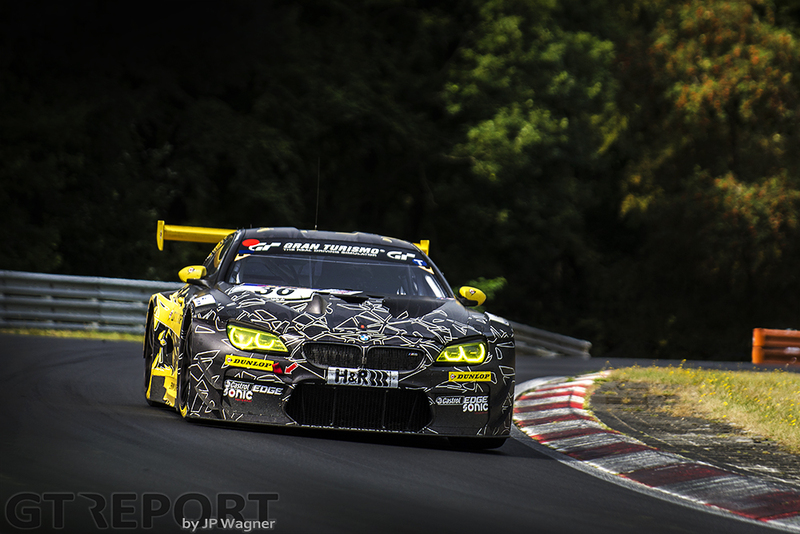 VLN’s races post-24 Hours of the Nürburgring have been far from a quiet encore. 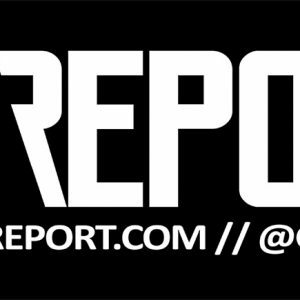 The races that followed the long one have seen some of the most competitive racing of the season. Whether it was the rainy race in June, the thriller in July, or Haribo Racing’s strategic win in August, every single race since the twice around the clock was one to remember. On Saturday morning the writing is on the wall that today will be another one of those races. 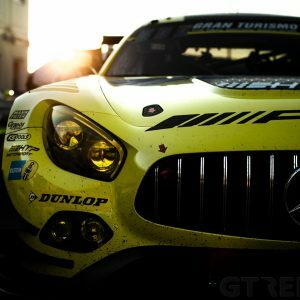 Not only goes Black Falcon Mercedes-AMG GT3 pilot Manuel Metzger out to shatter the unofficial VLN lap record with a lap of 7:54.497, he’s followed into sub-8 minutes territory by six other drivers as well. Black Falcon isn’t the only team gunning for the win in this six-hour race. 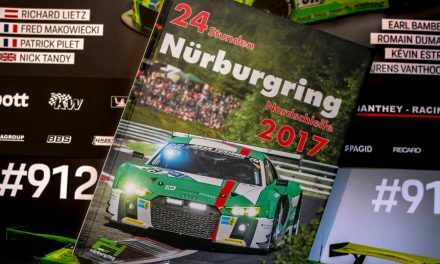 Although the team has won the most important Nordschleife race of them all, they have yet to follow up with a win in VLN. 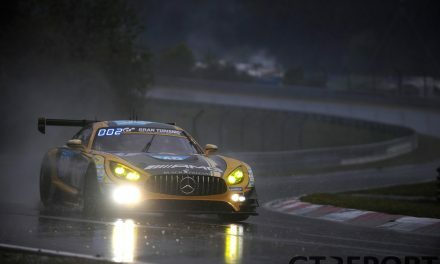 Metzger, the winner of the N24 and since then on AMG’s shortlist to become one of theirs, shares the car with AMG-backed Yelmer Buurman and fast gentleman drivers Hubert Haupt and Gerwin Schuring. It’s Buurman who takes starting duties, solidifying his position in front when the lights go green. 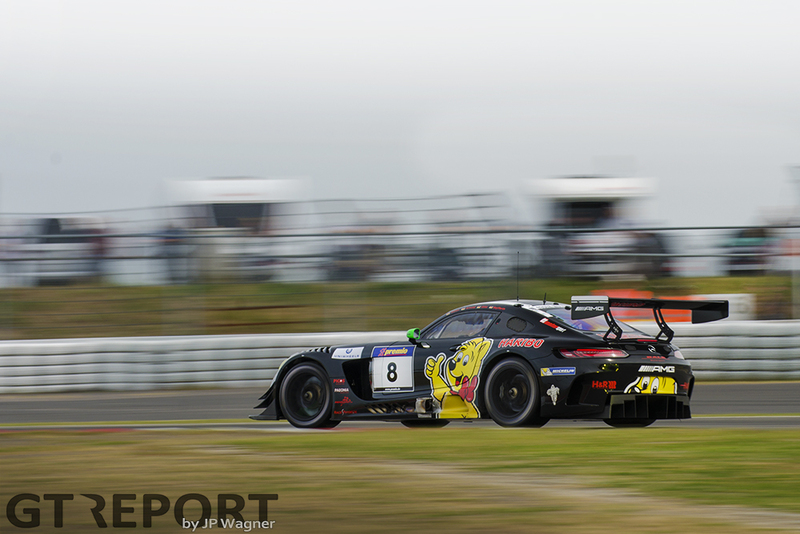 The Dutchman disappears onto the Nordschleife in the lead, chased by Lance David Arnold in the Haribo Racing Mercedes-AMG GT3 and Land Motorsport Audi R8 LMS GT3 racer Christopher Mies, the two winners of the previous two races. The Dutchman isn’t just letting them have the lead, they’re going to have to work for it and work for it hard. Arriving Bergwerk for the third time, Buurman is held up in traffic. Mies has been waiting for this moment and strikes at Kesselchen, putting the Audi into the lead. Mies’s lead isn’t to last for long. A slowly deflating tyre forces the Audi to make an unscheduled pit stop at the end of the next lap, throwing it, at least for the time being, out of the lead group. While the lead throughout the race shifts from team to team, only a few manage to remain free of trouble. Black Falcon’s blue AMG hits trouble while leading and is removed from the battle for the win during Metzger’s stint when a flat tyre costs the squad from Meuspath more time than they’re able to recover from. 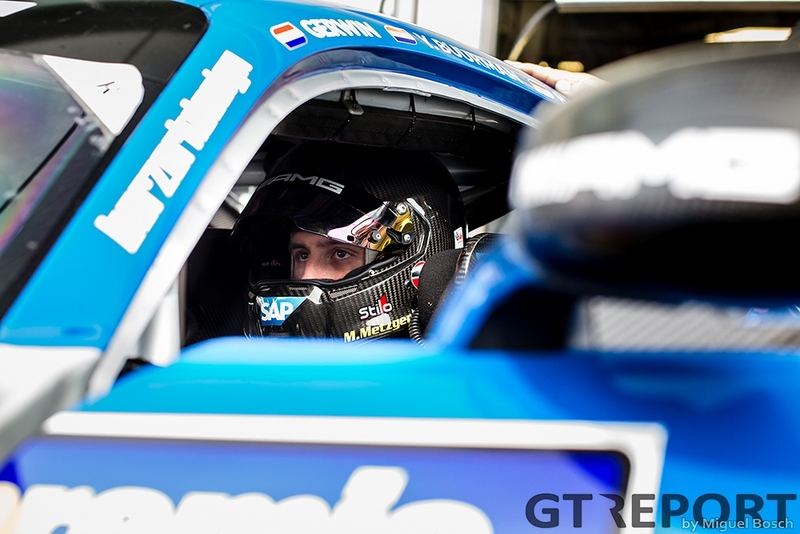 HTP Motorsport goes for the same strategy that brought Haribo Racing the win two weeks ago and after every once and a while gets a taste of the lead, but eventually drops out with damage after contact with another car. Land also had its fair share of bad luck early on, but is right back in the thick of it three hours into the race when Mies and De Phillippi are the leaders at the halfway point. By then the top four seems settled: It’s Land, Walkenhorst, Haribo, and Manthey, all lapping the Nordschleife within a minute of each other. 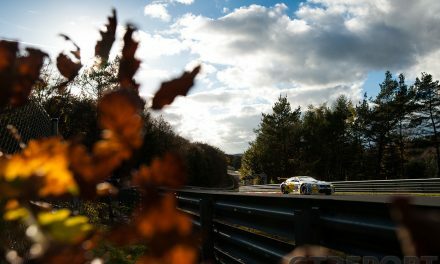 Haribo Racing isn’t immune to bad luck either, but theirs will come in the final hour, after a three-way battle ensues between the leading Manthey Porsche, chasing Land Audi and Haribo AMG in third. The Porsche takes the lead for the first time just over three hours of racing, having come from eight place and slowly working its way to the front with flawless drives by Patrick Pilet and Jörg Bergmeister. Around the start of the sixth hour the three leaders one by one make their pit stops. It’s the pursuers’s last chance to strike and this pit stop will be the starting point of an all-out attack on the Porsche. First it’s Alzen into pit lane, followed by Pilet a lap later, and finally Mies another lap later. Looking to get the jump on Haribo, the Land team decides to cut it extremely close with fuel and send Mies out as soon as he has enough fuel to make it to the finish and no further. 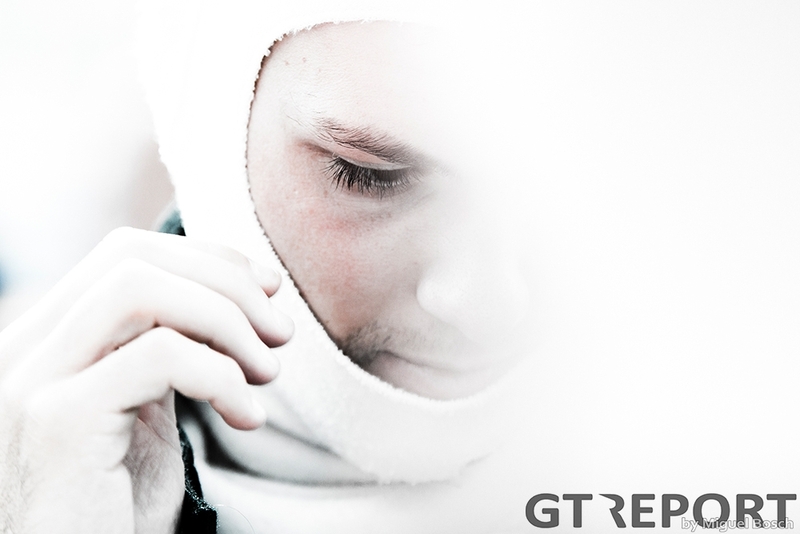 Part one of their plan pays off: The Audi works driver rejoins the track in second place, in front of the Haribo AMG. Next part of the plan is to bridge the gap to the Porsche. Lap by lap Mies cuts into Pilet’s lead. There are no more Code 60 Zones, there haven’t been any for a while, it’s all flat out through the Eifel now. This outright speed poses a new threat to Land: The amount of fuel in the tank is dropping to a worrisome low level and it’s becoming uncertain whether or not the Audi has enough left to reach the finish. Mies has to mind the fuel consumption, dials back his speed somewhat but keeps the pressure on the leader, getting ready to celebrate second place. 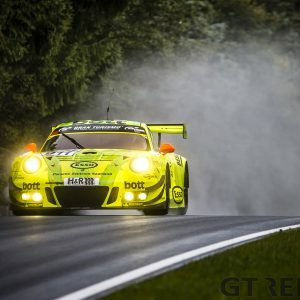 Pilet races onto the start-finish straight for the final time to celebrate Manthey’s first win in three years, coming in the first race of the Manthey Porsche 991 GT3R in new colours, with its neon yellow and green accents a throwback to the team’s privateer days. The pace today has been extremely high. It started in the morning with Metzger’s record pole lap, and ends with a new distance record of 43 laps or 1,047.394 kilometre. Mies is expected to drive onto the start-finish straight any time soon, but he’s nowhere to be seen. The disillusion at Land becomes palpable when the TV switches to a parked Audi at the Hohenrain Chicane. Land has run out of fuel, only hundreds of metres away from the chequered flag. “At first I couldn’t believe it,” a visibly disappointed Connor De Phillippi says. “We had talked for about five minutes about how much fuel we’ll put into the car and we decided on a number and everything was supposed to be quite safe. But before [the pit stop] the fuel light came on, so we knew it was going to be close. 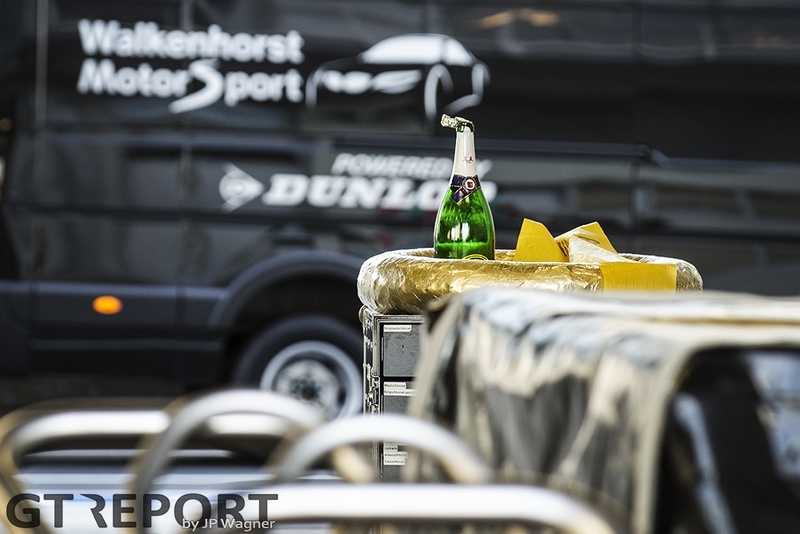 The plan was to just make it across the line, to not be able to make it back to parc fermé. “I had to go into the truck, I was too nervous. When I walked out and I saw everyone looking damp, I knew it was over. While the stranded Mies looks on as cars drive by, Uwe Alzen in the Haribo AMG inherits second place. Half an hour earlier the podium seemed far away for the team from Bonn. A slowly deflating tyre forced the Betzdorfer into an extra pit stop. Taking on fresh tyres and enough fuel to make it to the end, the team unleashed the cut-throat racer back onto the Nürburgring, just behind Jörg Müller who was still going strong in the Walkenhorst BMW. With a decisive move around the BMW, Alzen slots into third and moves up to second at the chequered flag.